Holidays came to an end during this week. We returned home to cold Melbourne on the Thursday. There is something to be said for how life seems so much easier when it is sunny and warm as to when you are surrounded by cold and rain. We did a number of activities together to finish the holidays. 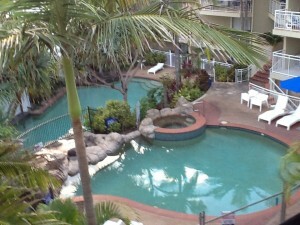 The resort we stayed at has the largest lagoon pool around here but it is extremely cold water. 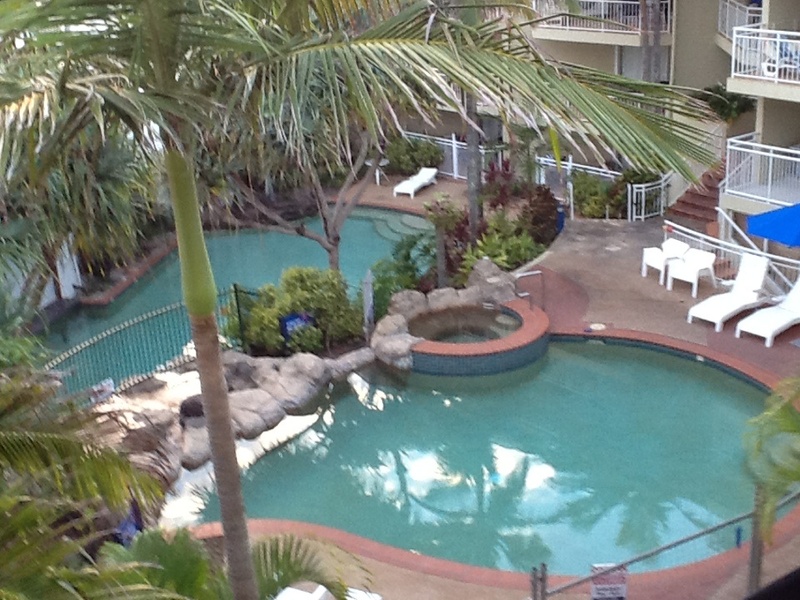 It also has two heated pools and two spas. In the six years we have been holidaying in our friends apartment, I have never been in the lagoon pool, other than to just dip my toes in. It is too cold. So I challenged the rest of the family to a race down the slide into the lagoon pool and swim to the other end and back, through the little waterfall. As soon as I said it, I knew the challenge was all about me. I needed to push myself to do something I really didn’t want to do. It was also something that the kids would love and they would realise that I was doing something out of the ordinary for me, trying something new. Once in the lagoon pool, it was actually quite refreshing after awhile. Not bad at all. 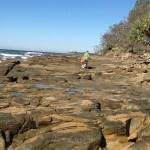 That same afternoon, we walked over the rocks on the beach to the next town, Matey & I in bare feet. Matey saw that we were going on an adventure. He even managed to climb up the steep grassy cliff to the top & back again. Princess wasn’t too happy about it but was soon distracted by a game of twenty questions. One morning we hired a small runabout boat (a little ‘tinnie’) & had heaps of fun as a family with the kids taking turns steering it up the river under a number of bridges and then back again. Great learning experience on rules of the boating with staying to the right of other craft, and which side the red markers and which side the green markers had to be. Matey loved making the boat do huge course corrections which frustrated everyone. Princess used to be really adventurous when she was younger but has become content with not pushing herself. She would have been happy to not go boating but once on the river, she had a ball. This holiday has highlighted to me that I need to look at how I can help her get her adventurous edge back again. 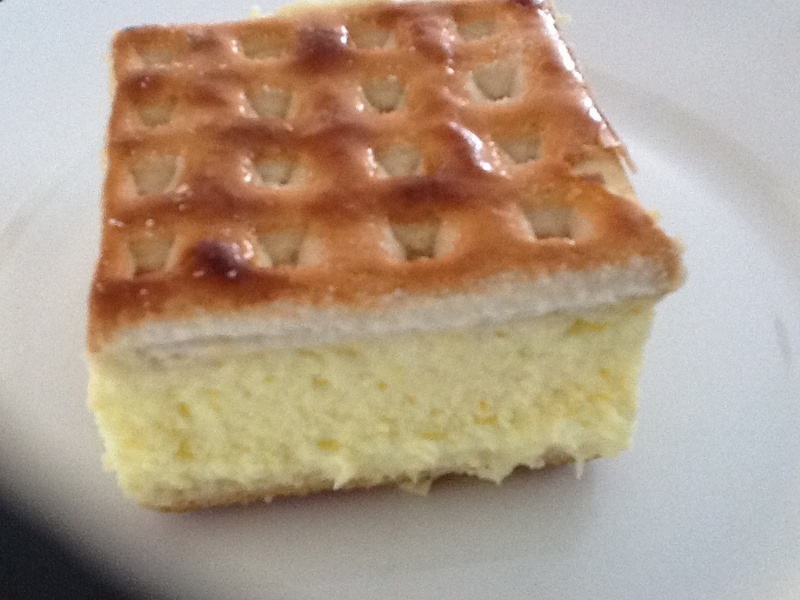 Reflecting back on the holidays, I realised that it wasn’t truly a holiday for me. More just a change of scenery and change of routine. I tried to spend at least 2 hours per day working on writing posts to commence this website & on writing a children’s book. I am well aware that it is extremely hard to get a book published these days, but I am going to try. When Princess was about seven years old, I realised that there was a lack of books written for advanced early readers. I started writing down some stories from when I was young & she loved them. I have written nearly twelve chapters, enough for two books and have planned the next two books in the series as well. I spent a bit of time most days on holidays writing more chapters. Princess has read over these and absolutely loves them although she didn’t like the small suspense at the end of a couple of chapters. Matey thinks they are so funny as well. Now I need to look at what to do next. It is a big dream, but if I don’t attempt seemingly impossible things, how can I expect my kids to aim high and change the world. Holidays in the middle of the school year are also a great time for me to reassess how we are tracking for the school year. I set goals on what I would like to see happen by the end of the year for each child, including some practical goals like learning to tie shoe laces. I see that it is ‘whole of life’ learning, not just traditional school subjects. I try to make these goals as realistic as possible, with practical outcomes so that we can review them at the end of the year and know immediately whether or not we have achieved them. We also discussed new chores that I wanted each child to start doing once we returned home. 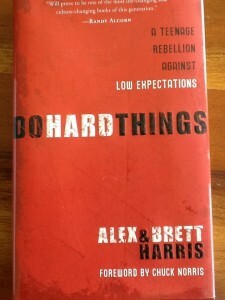 One thing I have realised in reading the book, “Do Hard Things” by Alex and Brett Harris is that my expectations for what our kids are capable of doing around the home is low. They do a few chores (washing & wiping up, wiping table & benches, sweeping the verandah, cleaning the toilets & bathroom, washing the wooden floors, making their own beds, helping put clean sheets on the bed, bringing the washing in & folding it & putting it away). I have compiled a new list of chores I am going to teach them to do once we return home that they will be responsible for. I have made up the list under daily, weekly and monthly chores. New chores will include vacuuming, sorting & washing the clothes, putting out the washing (we need steps to help them reach the clothesline), wiping out the microwave, cleaning the windows & glass doors (several per month), Princess ironing simple things, weeding the garden, cooking an evening meal weekly, planning weekly menu & filling out the shopping list based on the weekly menu. I had always believed that Princess at aged 10 was too young to be ironing, mainly because at that age, I had been responsible to do our family’s ironing and had badly burnt my lower arm on the iron. The scar is still noticeable. When my brother and his family visited us on holiday, we got to talking about chores with their kids & their daughters aged 9 & 12 do simple ironing. I commented on the fact that I didn’t want Princess to get burnt. My sister-in-law can remember learning to iron at age 19 and burnt herself then. She believes that once you burn yourself once, you will always be careful after that. We did not have kids for them to do our housework, but I believe that part of my parental responsibility is to train them up in being able to manage a household for themself. When I left home to go to the nurses hostel at age 18, I had never cleaned a toilet or used a washing machine. Mind you, I had cooked the main meal every night all throughout high school & had done many other chores. My niece, when visiting at the weekend, commented to me that we must be rich as we seemed to have a lot of holidays. I replied that no, their family was a lot richer financially but that we try and take holidays annually because we value family holidays. We value creating memories together. We value working hard but then enjoying some rest and relaxation together. Our holidays so far have never cost us a lot of money. Somehow I always seem to be able to get some fantastic deals or, like the resort we are staying at the moment, we pay a fraction of the price due to a friend owning the apartment and I scan the internet for several months each year getting the cheapest possible airfare. It depends on how you look at things. Financially, we would have been better putting the money over the last ten years into our house mortgage, but what does that communicates to our kids? What does that teach our kids? Had to laugh as two days before the end of the holidays, we returned all our library books. The librarian even graciously went out the back to the returns chute to help clear that so we could be sure all the books were returned and none lost. After all that, Princess found a new book in a series that she has read some of but not all. She just had to borrow that book. Mind you, it was read within a few hours. It just meant another trip to the library. I must say though, I love the fact that our kids love reading. They devour books. This morning we read our family devotion instead of at dinner time as hubby and myself were going out for a meal together and the kids were being babysat by hubby’s parents. The theme was “solving problems” and also looked at welcoming problems so that we grew as we learnt to solve them. Hubby then extended it by getting the kids to think of different people they had read about who had seen a problem and then did something to help fix/solve the problem. Great time of reflecting on great people of history. I really believe that we can learn so much from history. If we don’t know our history and learn from it, we are liable to repeat the same problems over again. Thursday night we arrived home from holidays and all unpacked so that we were ready to start afresh Friday morning. Hubby was out quoting work on Friday and we started back on schoolwork but with a difference. Started with a soaking time (listening to a piece of music and asking God to take us somewhere special and then we asked Him some questions). We then all journaled separately what had happened for us. This was followed by our cross body exercising for ten minutes. 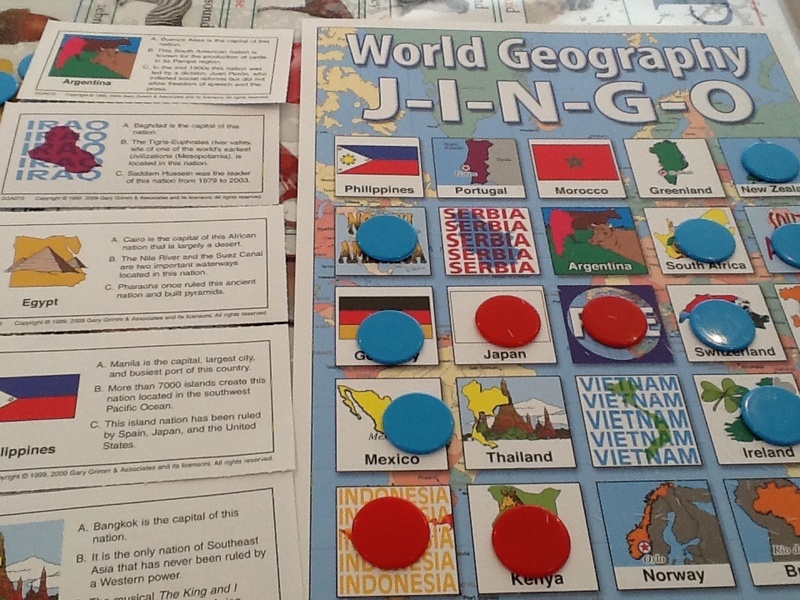 I then introduced a new geography game that came whilst we were away. The kids loved it. Cost $15 from the USA. 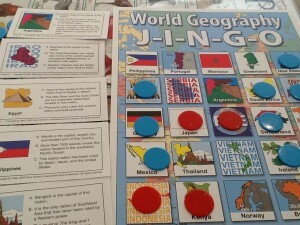 Called ‘World Geography J-I-N-G-O’. Basically a geography Bingo like game. It has cards with three clues about the country on it. Loved the game but quality probably not what I thought eg clue cards are just card stock and could easily get damaged. Kids learnt a lot though and it gave me an idea as to what they know or don’t now about continents and countries. Princess asked to play it later in the day instead of playing with the neighbours kids. They have also played it several times since then, so quite a hit. 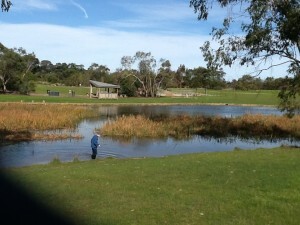 I had read about several homeschooling families, both in the U.K. and Australia, who are doing year long pond studies. 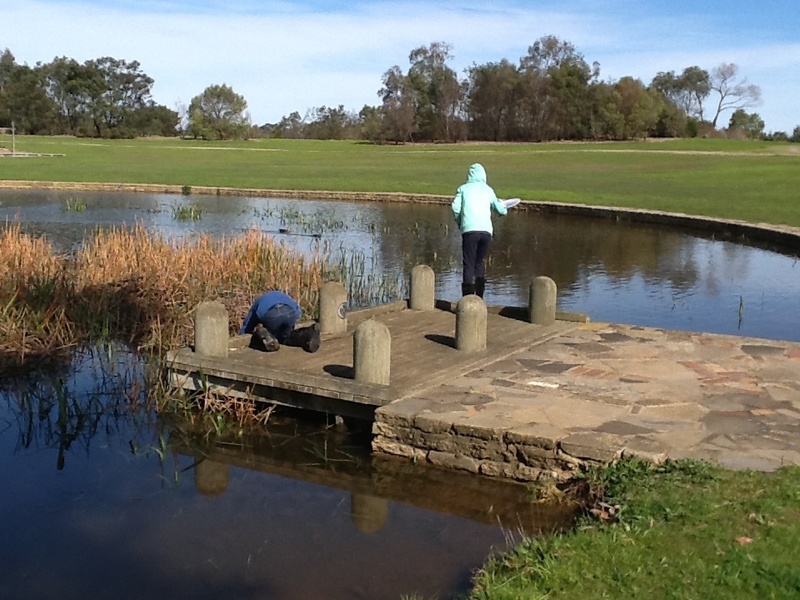 They are visiting a local pond either weekly or fortnightly and noticing the changes and documenting facts about nature. Great blogs to look up (www.ourworldwideclassroom.blogspot.com and www.angelicscallywags.wordpress.com). After lunch I felt it was appropriate to start today. 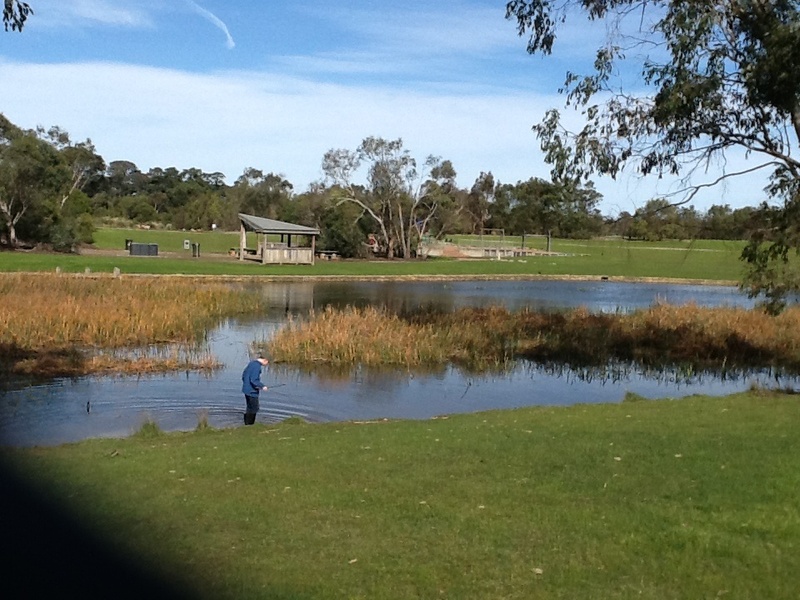 Thus, we drove to a local pond and playground area about ten minutes drive from home. Princess was in the middle of reading a book about Queen Elizabeth growing up and didn’t want to go, preferring instead to read. Matey, of course, was excited. I was actually amazed at the condition of the pond. It is nearly three years since we last went to this pond/park. The pond had heaps more weeds and the water was quite murky and dirty. There were no tadpoles or fish of which there was an abundance last time. There were 4 ducks this time. The kids have decided the white duck ‘Snow White’, the pair of grey ducks ‘Splish’ and ‘Spl osh’ and the baby duckling ‘Puddle’. There was also a native hen but the kids weren’t interested in that bird and just wanted to call her ‘Henny Penny’. 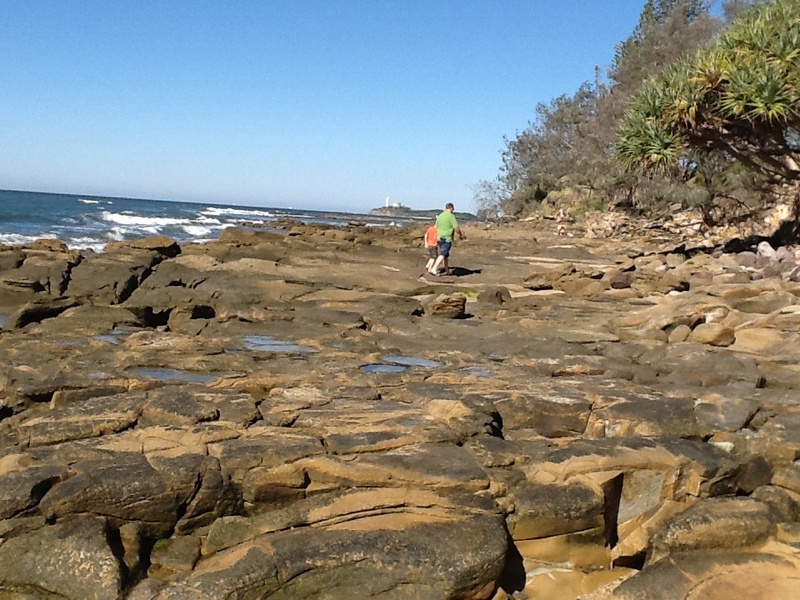 Matey was quite disappointed there were no tadpoles as he had brought his fishing net and jar to catch some. We collected some leaves off the different bushes/trees and also white feathers from the ground from the duck and white down from the duckling. We found a marker for the water level so that we could keep track of that. We plan to visit the pond fortnightly to observe the changes and find out more stuff. When we returned home, they both sketched a picture of the lake. Princess wanted to make the quick vanilla slice recipe that a friend had given her a few weeks ago. This is an extremely easy recipe taking only a few minutes to mix until it is in the fridge for an hour. Meanwhile Matey decided that he would help out around the house, having heard our discussion on chores earlier in the week, he then proceeded to weed the back garden and then empty the water off his sand pit cover, enlisting his friend to help in this task. Earlier in the day, he had asked me to show him how to sort the washing and put the machine on.